Tag Archive | "CS Library board"
The groundbreaking of the new Cedar Springs Library took place Saturday, July 9 at the corner of Main Street and W. Maple. Photo by J. Reed. 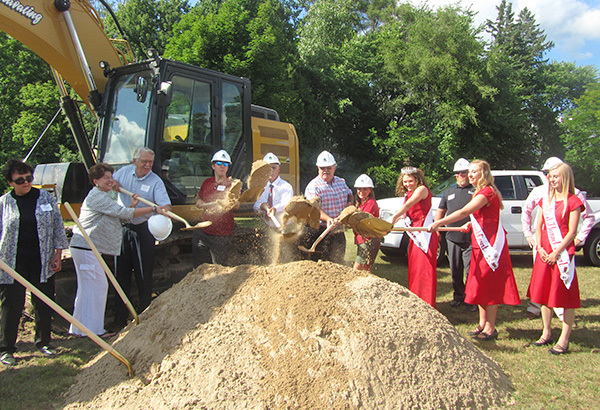 It’s been an exciting year for those helping to bring a new library to the Cedar Springs area. The CS Library board, Community Building Development Team, the City of Cedar Springs, Solon Township, Friends of the Library, and community members have all worked together the last few years to get the project off the ground, and they finally realized their dream on January 9 with a celebratory groundbreaking at the corner of Main and Maple Streets. “I’m only one, standing on the foundation prepared from the 1800s to this present day by a long line of educators, professionals, town folk, volunteers – enthusiastic people of vision and hope,” remarked Librarian Donna Clark. “Our goal is to make the Library a central hub, providing an open environment to enhance access to the world of knowledge through mentoring, networking and collaboration, and to provide quality resources for personal growth and lifelong learning,” she added. After the speeches, several people from area boards moved dirt with the golden shovels provided by Nugent Builders, the builder on the project. The project is expected to be done late spring. A unique metal sculpture, made by artist Steve Anderson, of Anderson’s Metal Sculpture, was installed on the property behind where the new library is being built. The sculpture is a stainless steel, artistic representation of cattails among dragonflies.